As part of our Connected Learning Community, we are highlighting the importance of balance, safety and responsible behavior online (generally called “Digital Citizenship“). During the week we will have a variety of activities, including short conversation starters each morning in tutor group, a specialized tutor lesson for the week, and extended sessions with each of the middle school grade levels, all culminating in our MS Assembly on Friday morning. For more details, see the MS Digital Citizenship Week Overview document. 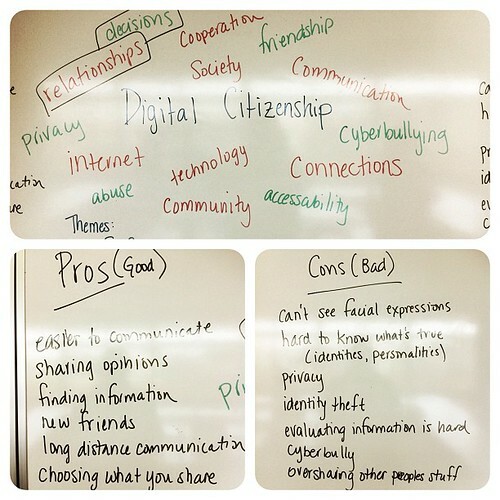 Digital Citizenship Week is intended to enhance and support our current Digital Citizenship curriculum, currently taught in Humanities: Digital Dragons. We’ll be highlighting these themes again at the end of the year with a special visit from Robyn Treyvaud, amazing speaker and leading expert on citizenship. Conversations during every class to support the themes of balance, safety and responsible behavior online during the week (and beyond) would be a great way to help build these important understandings. Well done MS Tutors! All tutor groups now have their own assessment calendar on Google Calendars, and they’ve been shared with all of the appropriate teachers. A quick overview of what major assignments students have at a glance. A way for both students and parents to automate homework reminders through their mobile devices. A simple, but foundational tool for students to explore, so that they can grow into a tool that suits them best. So, now that we have the actual calendars set up, the next step is to teach students (and parents) how to subscribe in their own Google Calendar (or iCal or whatever tool they use) so that they have all of their assignments in one place, plus all the automated reminders that comes with it (Student Tech Team is making a video now). In addition to subscribing to the assessment calendars, students can also add their own assignments and reminders to their Google Calendar to have everything in one place – just like an adult would use a calendar. The parents in our Parent Tech Coffee morning have already seen how this can work. Thanks for working together to make this happen! It will be great to see how students can build their own organizational skills using effective strategies thanks to this great foundation. Since we’re just starting out with blogging, we might be asking students to do very simple blogging now, and we certainly have the potential to develop complex blogging skills and tap into the true power of blogging. I’m also working on finding other schools around the world that are working towards this type of blogging to be “buddies” with our students. Hopefully this can begin in February. Plus, you can organize them however you want – so you can now alphabetize them, “nest” pages or categories or links under other pages, categories or links, and even mix and match pages with categories. Basically, this will allow you to set up your blog exactly the way you want with almost no restrictions! If you’d like to see how it can look, check out Jesse, Isabelle, Adam, Madeleine, Dale‘s blogs. Edublogs has posted a tutorial about how to set this up following exactly the same way we suggest you manage your blog. Give it a try, or stop by the IT office for in person support. I promise you will love it! 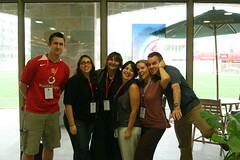 YIS was well represented at the Learning 2.011 Conference Conference in Shanghai! We were very fortunate to have Zoe, Elif, Rebekah, Brian, Trevor and Kim at the conference, sharing the fantastic work that we’re doing here and learning from others. Archive of all the tweets from the conference. Shanghai gave me the opportunity to learn with other K-2 teachers in a special cohort. Here is an outstanding site of free image resources shared by my cohort chair, Gail Lovely: Let Pictures Talk DO NOT be put off by this description. Her tools and sites could be used by many ages. This could help K to middle school at least. Her advice on copyright etc is valuable K-12. From the school perspective I have many tools to share and ways of intergrating technology. I have made connections K-12 that could help anyone. If you need a contact I bet I can find you one. For me, the Learning2.0 conference was about connecting with others and building a community of educators. There were dozen of tools that I was exposed to on this conference. I learned how to manage Google Apps and methods for creating a paperless classroom. I worked on digital storytelling in my Social Studies/English cohort using Picnik and Soundcloud . But I also learned about the Creative Commons community, which shares resources my students can use without fear of breaking copyright laws and how my students could contribute to that community. I heard how schools were skyping with schools in far away countries, showings students making connections across the globe. I talked to people at other schools who were doing similar things in their humanities classroom and who I hope to continue to collaborate with in the future. I met people I communicate with on Twitter and strengthened relationships with people who are interested in 21st Century learning. For me, Learning 2.0 reinforced the idea that technology in the classroom isn’t just how to use the tools, but more importantly the connections these tools help us create. Attending the Learning 2.011 Conference in Shanghai was a great opportunity for me to meet the other Elementary ICT facilitators and make connections with many teachers and professionals on educational technology from all around the world. I was in the cohort of ‘ Empowering Teachers’ with Alec Couros and Jeff Utrecht. I had a great time sharing my experiences and collaborating with my peers. I gathered a lot of tips and tricks in integrating technology in schools. I have seen different practices and implementations that inspired me and gave me a lot of ideas. Apart from attending my cohort meetings during the two days, I attended many workshops. I have attended an unconference about unplugging, a workshop on flattening classrooms, one on digital publishing and one on film making. In Elementary School digital storytelling has a big place and I have integrated animation projects in classes, sometimes using iMovie, Keynote, Photobooth,etc. In this workshop I had the chance to get more detailed lesson plans on filmmaking and a new editing tool; Final Cut Pro X. The workshop was run by Eric Pessoa who is the IB Film teacher in SCIS. He filled us in with his extensive knowledge on movie making. He walked us through step by step his IB Film class. You can find the details of his presentation and useful documents about his practice here. It was a great opportunity to travel abroad and attend the conference with my colleagues Brian Farrell, Kim Cofino, Rebekah Madrid, Trevor Kew and Zoe Page. In between workshops and cohorts we met and had great discussions about the integration of technology in our school. Moreover being there as a group of teachers presenting YIS was a great experience. Seeing our teachers presenting, discussing and sharing showed me how successfully we integrate technology in our school. The presence of YIS was a great addition to the conference. As always with conferences, the most valuable thing I’ve come away with is a sense of camaraderie. Many other teachers are struggling with the whys and hows of how to integrate technology into their lessons and so more than any tip or contact or tech tool, this sense of collective struggle did somehow provide me with a much-needed professional push. Although it may be schadenfreude, I was reassured by the struggles of fellow professionals. I’ve found the same at the children’s writing conferences I attend, surrounded by other writiers. My father says the same about law conferences, despite being surrounded by lawyers. Same job, same boat, (same iceberg). Read more on Trevor’s blog… or click here for a link to the webpage with useful tools and practical suggestions for integrating technology into lessons.